Leaving Montana -- What every decent, law-abiding citizen should do. LEAVING MONTANA -- WHAT EVERY DECENT, LAW-ABIDING CITIZEN SHOULD DO. AND DON'T EVER GO BACK UNLESS IT IS TO HELP EXPOSE THE RAMPANT CORRUPTION. I'm officially out of Montana for a while. I'm safe in Idaho. Well, as safe as one can be in a state with crazy Federal Express employees and policemen who will steal everything you have, including the car you weren't in. It was a rough day. Turning my head a lot, as driving requires, wreaked havoc on my dizziness. I didn't think I would be able to make it all the way, but I did. I ran off the road once. That was scary. That could have been instant death at a lot of places along this rough two-lane road. 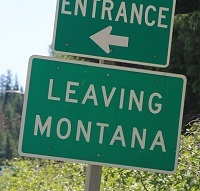 I was uplifted when I saw the "Leaving Montana" sign. I saw a number of Moose Crossing signs today, but no meece. I would usually hook a U to get photos of such important signs, but I just didn't want the day to last another minute. I am trying to get in to see a neurologist. And I have a wide variety of projects that I will be working on. It got to 108-degrees in cool Idaho today! I still have the GPS ankle monitor.